Our story starts five million years ago when a small sandpiper wandered along the shore, seeing a world we will never know. The tiny tracks the sandpiper left behind were covered with sediment and fossilized by the geological forces that created what is now the Porter Family Vineyards in the Coombsville region of Napa Valley. From our hillside vineyards and underground winery, our Family makes small amounts of beautifully hand-crafted wines—each one carrying the unique signature of this place. We retain the fossilized footprints of the sandpiper found on our property as a reminder of the incredible history of our winegrowing site, as we turn our heads to the future and the latest in winemaking arts to craft our special wines. 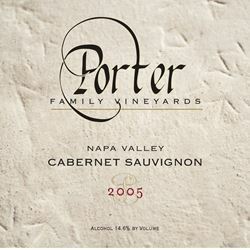 To join the wine club, visit www.porterfamilyvineyards.com or call 707-927-0765. The Sandpiper Club includes two levels: Fossil Collector and Paleontologist. Porter Family Vineyards is certified under the Napa Green Winery Program by the Napa County Department of Environmental Management (DEM) and the Association of Bay Area Government’s (ABAG) Green Business Program and completed all the regulatory components needed for environmental sustainability. These components included developing water and energy conservation methods, preventing pollution, and reducing solid waste. In addition to developing sustainable winery practices, this program is set to become the standard for the state of California. Porter Family Vineyards is certified under the Napa Green Certified Land Program. Porter Family Vineyards has created and implemented a customized farm plan with measured results that addressed all aspects of its property, vineyard land as well as non-farmed land, including practicing soil conservation, water conservation, stable drainage, riparian corridor enhancement, fisheries and wildlife habitat enhancement and long-term improvement and sustainability.